This monitor is for the S100 bus PDP-11 CPU board described here. Unlike the Intel family of CPU's, the PDP-11 starts up using a "Power On Circuit" that either directs the CPU to its own internal (simple) monitor or to and external ROM. This is all described in some detail here. Here is how the monitor signs on when the CPU gets control of the S100 bus with the Z80 Monitor "O" command. Please note this monitor is currently under active development (April 2018). There are sections that call upon the "PDP-11 Support" board to load an OS from a TU58 tape drive that are not complete. Please return here from time to time for updated versions. Setup all equates for ports and memory locations etc. Also please note there are various equates at the start of the monitor code that you need to adjust depending on your need (S100_ONLY, for example). The actual PDP monitor assembly language code is split into two completely separate files, PDP_MON_LOW_PAGE.MAC and PDP_MON_HIGH_PAGE.MAC. It is very important to understand that the code in either file knows nothing about the code in the other. The vast majority of the monitor code (currently) resides in the PDP_MON_LOW.MAC file. In fact you can use this code/file alone to run the monitor just as you did for the earlier "single page" monitor e.g. the V1.5 monitor. It will for example run fine in the original V1.1 PDP11 CPU board. Currently two menu options, The "C" (XModem) and "O" (IO Ports) commands reside in the High Page for the V2 and later versions. Any further new code will probably also reside there. The trick is that when we input (anything) from the port ROM_HIGH_PORT the code in the U25 CPLD recognizes this event and switches the address line LA13 from LOW to HIGH going to both EEPROMS. The yellow text code above moves (unknown to the CPU) from the lower to the upper ROM page. This common code is the link between both pages. We load a menu option number into the R3 register, jump to the "Switching Routine", it is picked up in the HIGH page and processed in the normal way depending on the R3 menu number passed to it. When done, we jump to the ACTIVETE_LOW PAGE which lowers the LA13 line and again, unknown to the CPU it ends up in the LOW PAGE. This code is in purple above. It takes a little time to really understand this process. 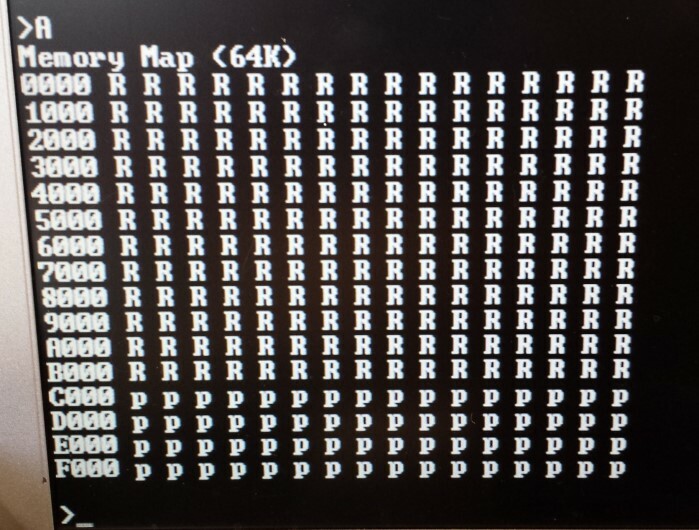 Remember the CPU does not know anything about this process. After the port input is done the CPU does whatever the next opcode in that ROM (page) requires. This facility allows us plenty of future space to write quite elaborate functions in the 4K (now 8K) ROM space between C000H and DFFFH on the V2 CPU board. Within the PDP11 Monitor.zip file I also provide a "PDPL.bat" and "PDPH.bat" to automate the assembly process under windows. There is however one catch, programming the ROMs is quite tricky. You have to place the 4 segments of code exactly as shown in the above diagram. It would be easier if our assembler generate .HEX code but it only generates .bin files. You are already familiar by now I assume of burning the .bin file EVEN and ODD bytes into two ROMS. The added twist here is we need to place two files in the EVEN bytes ROM and two files in the ODD bytes ROM. You have to be careful when you load up the second file you don't overwrite the first file. Assemble and make two .bin files, PLP_MON_LOW_PAGE.bin and PDP_MON_HIGH_PAGE.bin. Load the Wellon programmer program. From the Edit menu Fill the buffer with 00's and close it. With this dual page feature you have an extended list of Monitor options. The HIGH PAGE options currently are the "C" and "O" commands. They have square brackets around them in the menu, but otherwise behave exactly like the other menu items. Obviously if you are using the V1.1 Board or only burn in the LOW ROM PAGE they will not be available. The monitor code will detect this and warn you. Here is what the monitor signon looks like for a few commands. As you can see programming both EEROMS is quite tricky. Some ROM programmers may not in fact let you do a reburn as described above. When you are first building your board (or for the V1 board) just use the PDP_ROM_LOW_PAGE file and use do a simple "normal" Odd/Even ROM burn. Remember you do not need the HIGH page mode to boot up the monitor. 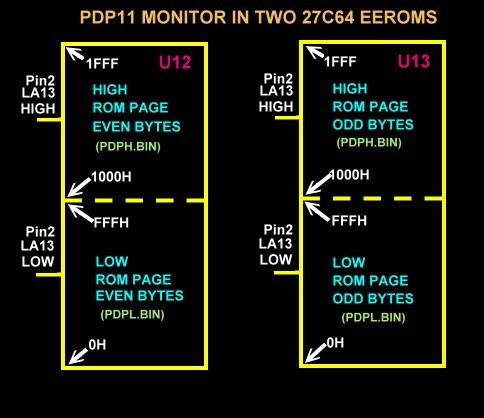 Please remember this PDP11 Monitor contains a few critical equates at he start of both the HIGH and LOW Page listings. Take care to set then exactly to suite your needs. ST8C4: equ FALSE ; FALSE if LP11 Printer output. TRUE (only) if output is to the S100_Parallel_IO Board. ; will always sent to Console IO board (Switch K10 is ignored on the CPU board). Please see here for additional PDP11 Software.